If you don't have an I'm Not at Work Card, now's your chance to score one for FREE. I got mine last week at the 89th and Broke blogaversary. 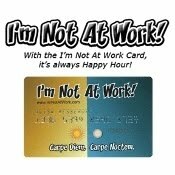 The I'm Not at Work card gives you special access to 24/7 happy hour specials and other deals, like free drinks on your birthday and discounted food. Normally $35, get yours FREE October 8. Our October "First Friday" party is actually on the second Friday so save the date! This month we are being hosted by Croton Reservoir Tavern, right next to Bryant Park. Open Bar is 7-8 and CRT always features $3 select drafts for 24/7 exclusively for I'm Not At Work Card Members. ...now for the surprise...tell ALL of your friends about this party. Everyone who comes to this party will receive a completely FREE I'm Not At Work "24/7 Happy Hour" card ($35 value)! This is our way of thanking all of our loyal Card Members (yes even current Card Members will get a card to share with a friend) and our newsletter subscribers, Facebook Fans, and Twitter Followers who do not yet have cards. P.S. So just to be clear, anyone can come, get a free INAW card, and drink free!